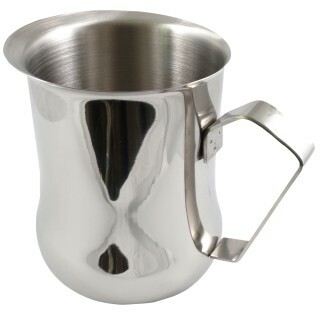 This polished stainless steel jug has 'Belly Shape' sides that help to froth the milk, and also has a comfortable handle. The inside of the jug has a brushed finish, and a wide spout reduces drips. It is the perfect shape and size for frothing milk for one or two cappuccinos. The wide pouring spout gives excellent control when making your cappuccino or latte.